What can you say about a baseball franchise that was owned by a singing cowboy for 35 years and the world's most popular mouse for another seven, except that it had to be interesting, even when it was dull. Gene Autry was one of Hollywood's wealthiest stars when he bought the new American League franchise about to be planted in California. It started a 35 year love affair between Autry and his Angels. The Halos played their first game in 1961, beating Baltimore 7-2. They wound up 70-91, a winning percentage of .435, the best ever recorded by a first-year team. Two years later it was Dean Chance who shot across the sky. Only 5-5 at the All Star break, he finished the 1964 season 20-9 with a league leading 278 strikeouts, 11 shutouts and a 1.65 ERA that earned him the Cy Young Award. The Angels stayed fairly respectable through the rest of the 1960's, and in 1970 produced their only batting champion in Alex Johnson, an outfielder they acquired the year before from the Reds. Johnson was moody, given to fits of pique and anger and was another great source of headlines for the press. He was gone to Cleveland a year later. The Angels traded their franchise player, Jim Fregosi, to the Mets for Nolan Ryan in 1972. Ryan became the premier pitcher in the league, tossing two no-hitters in 1973 (when he also struck out 383 batters) and one each in 1974 and 1975. Despite the individual achievements of players like Chance, Johnson and Ryan, Gene Autry's postseason trophy was empty accept for Tumbling Tumbleweeds until 1979. That year, a veteran group of Angels finally put the team over the top in the American League Western Division led by Don Baylor's MVP season (.296, 36 home runs and a league leading 139 runs batted in). Veterans like Rod Carew (.318), Bobby Grich (.294, 30 home runs, 101 RBI) and Dan Ford (.290, 21 homers, 101 RBI) contributed much along the way. The Angels lost the American League Championship Series to Baltimore. After a few off seasons, Autry's boys were Back in the Saddle Again in 1982, with many of the same veterans now joined by Reggie Jackson (.275, 39 HR, 101 RBI). California defeated Milwaukee in the first two games of the best-of-five league championship series only to lose the next three in a row. Jackson was with the Angels when he clubbed his 500th home run in 1984, but the Angles did not have the horses to compete that season. With Gene Mauch at the helm in 1985 they faded in September but rebounded to win the division again in 1986. Wally Joyner drove in 100 runs and hit .290, but no other regular hit better than .267. That was good enough for a pitching staff with Mike Witt, Kirk McCaskill, John Candelaria and Don Sutton all winning in double digits. The best-of-seven American League Championship Series started well for the Angels, as they won three of the first four against the Red Sox. They took a 5-2 lead into the ninth inning of Game Five, and had two outs when Don Baylor (ironically) hit a two-run homer to make it 5-4. Then with another man aboard, Dave Henderson hit a shocking two-run homer off Angel relief ace Donnie Moore to give Boston 6-5 lead. Although the Angels managed to tie in their half of the ninth, they lost in extra innings and the next two games as well. A still-despondent Moore committed suicide three years later. The Angels remained in a downward spiral after that. The only two seasons in which they contended, 1989 and 1995, they blew comfortable August leads. In 1995 they lost a one-game playoff to Seattle to decide the division. Autry sold his interest in the Angels to the Walt Disney Company in 1997. Disney promptly spruced up the ballpark, changed the logo and added new promotions. But most importantly it let the baseball people, led by manager Mike Scioscia, build up the team with quality talent and youthful pitching arms. Solid players such as Troy Glaus (.250, 30 home runs, 111 RBI) and Garrett Anderson (.306, 29 homers, 123 RBI) helped the Angels take the wild card in 2002. They then torpedoed the Yankees and the Twins in the American League playoffs, and then defeated the San Francisco Giants in seven games for their only world championship. They pulled a miracle of their own, rebounding from a 5-0 deficit after six innings of Game Six, when the Giants were eight outs from winning the championship. Long time Angel players, fans and employees found the championship bittersweet as Autry had not lived to see it. He had died four years earlier. Disney World sold the team in 2005 to advertising executive Arturo Moreno, who became the first Hispanic owner of a Major League baseball team. A four-year dispute ensued as to what to call the team. They were originally called the Los Angeles Angels. Then they became the California Angels. 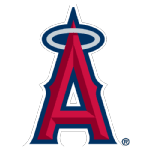 Today they are officially the Los Angeles Angels - the one constant during the Moreno years is that the team has remained competitive, making the playoffs four of his five years as owner. They havent returned to the World Series, but between Disney's promotions, a larger-than-life owner in Gene Autry, Bo Belinsky, Alex Johnson, Nolan Ryan and his no-hitters, Reggie Jackson, the monumental losses and incredible comebacks, the one thing you cannot call the Angels is dull. Mike Witt 2.0 " "
NEW YORK AT CALIFORNIA (D)  Newly renamed California Angels got off on wrong foot, losing to Yankees 8-1. Ford beat Angels for ninth straight time, bringing his career record to 12-3. Mantle , returning to Bombers' lineup after three-day layoff, settled issue quickly hitting three-run homer in first inning. Oft-injured outfielder also drove in another run with single in second inning. Source : The Sporting News. On September 14, 1978 , the Angels set a team record for runs scored during an inning with thirteen (13) in the ninth (9th) inning versus the Texas Rangers . On May 12, 1997 , versus the Chicago Cubs they duplicated their own record during the seventh (7th) inning. On August 25, 1979 , the Angels set a team record for hits during a game with twenty-six (26) versus the Toronto Blue Jays . On June 20, 1980 , versus the Boston Red Sox they duplicated their own record once again.